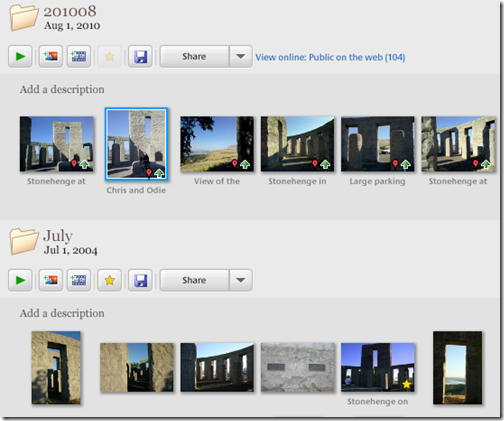 Picasa Tip: Using Search to Find your Pictures – Learn Picasa and Google Photos! One of the reasons I use captions on all my good pictures (video:Add Captions to your Photos) is so I can find them even years later. I keep most of my 40,000+ pictures on an external hard drive (video: Move Folders of Pictures to an External Drive), but they all show up in Picasa’s Library so I can view any digital picture I’ve ever taken as long as I can find it! Let’s say I want to see a picture of that cool Stonehenge place we visited in Washington State. I just type Stonehenge into the search box, next to the magnifying glass in the upper right corner. (video: Searching for Pictures) Picasa will instantly match whatever you type by looking at captions, folder names and descriptions, file names, tags, people, albums, and more. Since I entered captions on all the good pictures of Stonehenge, my search will produce results. Notice that it even finds that we were there 2 times, once in 2004 and again in 2010. 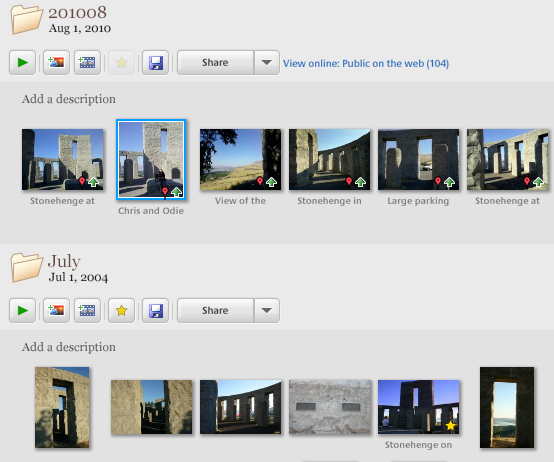 I didn’t have to know that, it found all pictures with the word Stonehenge in the filename or caption. When Picasa finds matches, it filters the pictures in the library to just those that match. It will appear that all your other pictures are gone. Let’s say that, in my thousands of photos, I have a few hundred with the word ‘beach’ somewhere identifying them. If I search for ‘beach’ my library view will now consist of the few hundred beach pictures. It will look like I have no pictures except those of beaches. You need to click the ‘Back to View All’ in order to see your complete library again. Captions and filenames aren’t the only thing that can be found with search. Picasa will also search for your word in the Folder name where a picture lives, or any album that includes the photo, or tags or even the camera name that took the picture. Dates: you can enter a year, e.g. 2007 in the search field and your results will include all pictures taken in that year. You can narrow your search by adding multiple words. If you add a month, e.g. 2007 August – your search will be limited accordingly. Just realize that this will also find pictures from 2007 with the word ‘August’ in the caption even if it wasn’t taken in August. There is no way to limit searches to any one source – Picasa searches everything: Filenames, Captions, Tags, Folder or album names, Camera maker, and Dates. Colors: If you’re looking for that perfect picture to match your yellow walls, you can enter Color: yellow in the search field to see all picture with that color! Just remember to click that all important Back to View All button! Geeks on Tour is a membership website. There are lots of tutorial videos on editing your pictures with Picasa’s tools. The first 3 are free for all to view. To see all of them, you need a Geeks On Tour membership. It’s only $58/yearly. Join Today! Great and timely hint. I just covered Picasa’s search bar in my class here in Sun City yesterday. But your discussion is much more detailed and I will forward your email to all in my class. This morning in another presentation I gave on Picasa’s movie capabilities I used the filter button for movies, viewed one, paused it, and then took a snapshot which was sent to Captured Videos. I wanted to go back to show the audience that we had must created a jpg photo and I could not find Captured Videos in the Projects collection. After a few minutes of confusion, Someone called out to clear the search view. Whew! Saved when the rest of the library came in to view. Your reminder was a good one.